The papers, released under the 30-year-rule, show that the British government took the threat so seriously that it drew up a detailed assessment of what the Americans might do. It was thought that US airborne troops would seize the oil installations in Saudi Arabia and Kuwait and might even ask the British to do the same in Abu Dhabi. 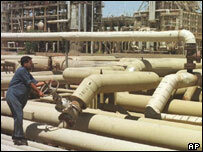 The episode shows how the security of oil supplies is always at the forefront of governments' planning. The British assessment was made after a warning from the then US Defence Secretary James Schlesinger to the British Ambassador in Washington Lord Cromer. The ambassador quoted Mr Schlesinger as saying that "it was no longer obvious to him that the United States could not use force." The oil embargo was begun by Arab governments during the Yom Kippur or October war between Israel and Egypt and Syria, which left Israel in a strong position. It was designed to put pressure on the West to get Israel to make concessions. The embargo was aimed mainly at the United States but many other countries were affected. The Joint Intelligence Committee (JIC) assessment said that the seizure of the oilfields was "the possibility uppermost in American thinking when they refer to the use of force; it has been reflected, we believe, in their contingency planning." This phrase indicates some knowledge of American plans. Other possibilities, such as the replacement of Arab rulers by "more amenable" leaders or a show of force by "gunboat diplomacy", are rejected as unlikely. The JIC believed that military action would take the form of an airborne operation, possibly using bases in Greece, Turkey, Cyprus, Iran (then a US ally) or Israel. "We estimate that the force required for the initial operation would be of the order of two brigades, one for the Saudi operation, one for Kuwait and possibly a third for Abu Dhabi," it said. Two divisions would then be flown in but the report gives a warning that the occupation might have to last 10 years. It would also alienate the Arab world and provoke a confrontation with the Soviet Union, though the JIC did not think that Moscow would use military force itself. There was a potential task for the British. The report speculates, again perhaps with inside knowledge, that the US might want Britain to capture the Abu Dhabi oilfields as some British officers were seconded to the Abu Dhabi defence force. "For this reason, the Americans might ask the UK to undertake this particular operation," it says. The prospect of the British military fighting seconded British officers is not gone into. The assessment reflects on the danger of action by Iraq, whose vice president at the time was none other than Saddam Hussein. "The greatest risk of such confrontation in the Gulf would probably arise in Kuwait, where the Iraqis, with Soviet backing, might be tempted to intervene," it says. It is made clear that the invasion would probably only be contemplated if the situation in the region deteriorated to such an extent that the oil embargo went on for a long time, threatening western economies. This is called "the dark scenario." In a follow up, a Foreign Office official noted: "Lord Carrington [the defence secretary] has suggested that some discreet contingency planning be put in hand"
In the event, there was no military action. The oil embargo faltered and was ended a few months later. Israel and Egypt went on to sign a peace agreement. "The US was so worried that it considered going to war to get its fuel"